Final score: Atletico Madrid 1-2 Chelsea. Antonio Conte’s men, undoubtedly the deserved winners, left the Metropolitano as the first away side to win at Atletico’s new stadium and made a statement in the process: we’re the best English side in the tournament and we’ve just produced the best performance by an English club in the Champions League in years. Manchester City and Manchester United will have much to prove after Chelsea created, hung on, fought, changed tactics, and never surrendered against one of the tournament’s top sides in recent years. No, the London-based side didn’t dominate by any means but they executed a solid game plan away from home and left Atleti’s supporters experiencing one of their usual nightmares – a stoppage-time defeat. The commoner headlines will mention Chelsea’s early chances they failed to capitalize on and the ever-dramatic finish to the match, but this is ESDF analysis and we’re going to focus on the blood and guts of the match – the tactics. Both Conte and Diego Simeone are managers who set up their sides in defence-first approaches. They believe that a structured defence, combined with a meticulous effort to weed out the opposition’s weaknesses, can also be the foundation for an effective attack strategy. #AtletiChelsea was a great tactical battle. 2 of best def units in football trading transitional counters. But Conte's men deserved the W.
Both teams displayed this on Wednesday night with both soaking up pressure, countering, working the wings, using long balls, and hauling crosses after decent link ups and combinations. On occasion and when a decent opportunity presented itself, both coaches took gambles and offered up some high and counter-pressing, mostly when the other side won the ball near the touchline or won a goal kick. This was a very careful and thought out affair between two excellent tacticians. So how did the teams set up? 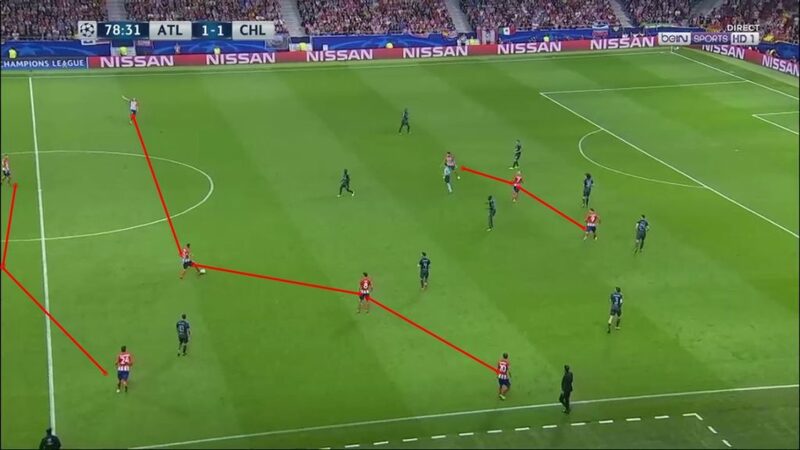 Well, Atletico set up in a 4-3-3 and Chelsea in a 3-5-2. 1. Try and use a triangle rotation with Antoine Griezmann up top to link within Chelsea’s penalty box. 2. Or use the overload to draw Chelsea to one side and then switch to the opposite ‘under-loaded’ side which will likely have more space to work with upon switching the play. A successful 1v1 can be done with a higher of success to an ‘under-loaded’ side rather than an overloaded side. The video below breakdown one of the common attacking strategies that Atletico used against Chelsea. It should be also noted that Atleti uses this tactic commonly against most of their opponents. But how did Chelsea defend this? Well, Conte analyzed that Atleti’s attacking shape is quite spread out in terms of the midfield’s closeness in proximity to the triangle overload. In the screenshot below you see that Conte’s men combat Atleti’s triangle overload with a 4-man unit to get numerical superiority. Also, since Atletico’s midfield isn’t close to the penalty area and spread out (Koke is out of frame, too) Chelsea decide to not play Thomas Partey or Saul Niguez closely. Lastly, you see that Tiemoue Bakayoko offers zonal cover incase Atleti’s overload breaks through. Upon Atleti’s switch of play, you saw the English club use a 5-3-2 with their midfield and two forwards travelling horizontally in a very compact and narrow manner. Chelsea wing-back, Marcos Alonso, pushes high up as well. While Atletico’s attacking strategy didn’t differ much from their usual patterns, they did defend differently when they wanted to disrupt Chelsea’s build up from defense to midfield. For a past reference, Atleti set up in a very aggressive high-pressing manner earlier in the season when they played Las Palmas. The video below breaks down how they pressed them. We’ll compare this approach to the one they deployed against Chelsea on Wednesday night. Anyway, against the defending EPL title holders, Atleti set up in a 4-1-2-3 high-press. It was less aggressive than the press against Las Palmas because Chelsea builds-up the play in a more spread out formation with only on midfielder really dropping deep. Why? Because Chelsea won’t set up in a closer formation because they’re not trying to build up through short, quick passing, they’re trying to find the cracks in Atleti’s defense and go direct. As a result, Atleti will have a harder to high-pressing due to Chelsea being really spread out and they’re likely cautious about Chelsea just passing over the press via long balls to wing-backs which they’re good at. The video below breaks down Atleti’s man-mark high-pressing approach. Although Simeone’s side lost the match, they were quite good at stopping a majority of Chelsea’s build ups via their 4-1-2-3 press. It was Chelsea’s counter-attacks that were the most threatening in terms of creation and chances. We’ll now take a look at those counter-attacking phases by Conte’s men. Below, we’ll see how a quick long-ball transition led Chelsea to use a 4-man overload to try and draw Atletico’s defensive block out of position. It’s hard to defend whenever a team have space and catch you on a fast transition toward your penalty area, so Chelsea figured they’d use the opportunity to overload Atleti’s right side to draw some players out of position. It didn’t work, but have a look as it was a common attacking strategy for Chelsea when they transitioned into attack quickly. In addition to this way of attacking, Chelsea’s 5-3-2 low-block, at certain times, was so effective with just eight men defending that Alvaro Morata and Eden Hazard were often left to find the best spaces for counters in a free-ish type role. They exploited Atleti many times this way. But, interestingly, they also displayed a unique space squeezing tactic within their defensive low-block. If ever Atleti left-back Filipe Luis tried to cut inside, N’golo Kante and Victor Moses squeezed the midfield and backline together to push Filipe Luis backward. Despite both sides trading tactical blows and Chelsea being the more creative on the counter, it was the home side that got on the scoresheet in the first when Griezmann finished from the spot at the 40-minute mark after David Luiz had pulled on Lucas Hernandez’s shirt and took him down in the penalty box. Chelsea got more aggressive in attack in the second-half pushing Moses and Marcos Alonso higher up the pitch with Hazard drifting wider to the ball side. Hazard did this because he wanted his teammates to overload one of Atleti’s flanks and when the switch to the right side came, he could get a clean 1v1 opportunity on Atletico right-back Juanfran. The screenshot shows Hazard’s positioning just prior to setting up Morata for his equalizing header in the 59th minute. With the game tied at 1-1, the second-half carried on with both teams going into defensive shells, that is until Simeone brought on Jose Gimenez with 13 minutes left to go and switched to a 3-4-3. Simeone pushed Filipe Luis and Juanfran higher up to play more crosses into Chelsea’s box with a three-man compacted together to play off a second-ball. In the end, Chelsea held firm and while Atleti were the more creative team in the last 12 or so minutes, it was Chelsea who won it in stoppage time. Los Colchoneros now sit in 3rd place in Group C without a win and Simeone’s side is in the biggest doubt, in terms of qualifying, in the Argentine’s whole tenure at Atletico. A big question mark looms over the Metropolitano.